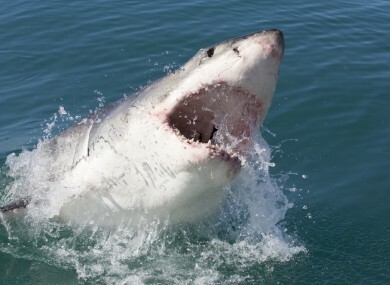 "I haven't gone away, you know"
GREAT WHITE SHARKS are likely to be rising in numbers off the coast of California and are not at risk of extinction despite some reports to the contrary, US researchers have confirmed. The findings are good news for the ocean predator, suggesting that around 2,000 of them are swimming about in the Eastern North Pacific, not 219 as research released three years ago had indicated. “If something is wrong with the largest, most powerful group in the sea, then something is wrong with the sea, so it’s a relief to find they’re in good shape,” said George Burgess, director of the Florida Program for Shark Research. “That we found these sharks are doing OK, better than OK, is a real positive in light of the fact that other shark populations are not necessarily doing as well,” said Burgess, a co-founder of the Shark Specialist Group of the International Union for the Conservation of Nature. The study appears in the journal PLOS ONE. The earlier count was based on research at two sites — the Farallon Islands west of San Francisco, and nearby Tomales Point — where seals congregate and so do the sharks that eat them. By accounting for all life stages of sharks there, researchers found that their numbers were more likely around 2,000, not 200. Since sharks are difficult to count, and populations were so fluid at those two sites, researchers also widened their research scope to include other known gathering spots from Mexico into British Columbia and Alaska. The US National Marine Fisheries Service has declined petitions to add white sharks to the endangered species list, estimating the Eastern North Pacific population at about 3,000 sharks. Email “Despite what you may have heard, great white sharks are NOT at risk of extinction ”. Feedback on “Despite what you may have heard, great white sharks are NOT at risk of extinction ”.